BOB ABERNETHY, host and correspondent: We have a report today on the moral choices involved in the intense negotiations underway in Washington over what to do about the country’s $14.3 trillion debt. If the debt ceiling is not raised by August 2, in just one month, the Treasury Department says for the first time in American history the government will not have enough money to meet all its obligations. The Administration wants Congress to raise the debt ceiling so the government can borrow more to pay those bills. 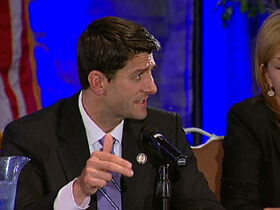 But many members of Congress say they want, first, a believable long-term plan to reduce the deficit. So far, there’s no agreement on such a plan, so the debt limit remains, and so does the countdown to default. All over Washington, from Congress to the White House, among the K Street lobbies, at the think tanks, and at scores of conferences and panels, experts are trying to solve the problem. 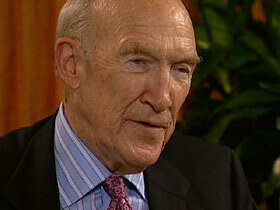 One experienced voice has been that of retired Republican Senator Alan Simpson of Wyoming. He was the co-chair of last year’s special presidential commission on the debt. ALAN SIMPSON: If we don’t get a plan out of this by August 2, then hang on tight. ABERNETHY: And “hang on tight” implies what? SIMPSON: Implies inflation. It implies the people who are going to loan us money want more interest for it. It will be a different lifestyle for Americans, and inflation will eat through the system, and the little guy will be the guys most hammered. ALICE RIVLIN: If we don’t raise the debt limit, we would probably have a crash in the markets, and it would be very serious. ABERNETHY: Brookings Institution economist Alice Rivlin headed the budget offices at both Congress and the White House. RIVLIN: I think we are talking about a moral issue. We do not want to leave our children and our grandchildren with a worse economy and a much harder life than we are enjoying. ABERNETHY: There’s no mystery about the cause of the debt problem. As the number of older Americans has gone up, so have the costs of the so-called entitlements—Medicare, Medicaid, and Social Security. New medical technology drives up health care costs, and two wars have gone unpaid for. It’s estimated that the war in Afghanistan is costing nearly $120 billion dollars this year. RIVLIN: To borrow without limit and without thinking how we are going to pay this back seems to me stupid and immoral. ABERNETHY: For Simpson, there is also the problem of selfishness. SIMPSON: Well, don’t blame it all on Congress. Blame it on the American people who sent people to Washington to bring home the bacon. And the way you got re-elected was you just went and got it for them, and now the pig is dead. There is no more bacon to bring home. ABERNETHY: Solving the debt problem is not only an economic and political challenge. The crisis raises basic philosophical and moral questions about the kind of government and society Americans want. Last April, the conservative majority in the House of Representatives passed a budget for next year proposed by the chair of its budget committee, Paul Ryan. He outlined his plan to the American Enterprise Institute. PAUL RYAN: This budget begins by lowering taxes, with the top individual and corporate tax rate capped at 25 percent, so we can get real growth and economic competition in America. ABERNETHY: …the conservative cause of reducing the size of government. 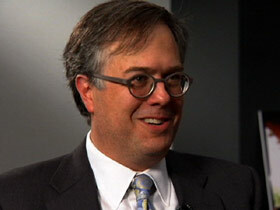 Michael Gerson, a former White House speech writer, is a columnist for the Washington Post. MICHAEL GERSON: I think it is fair to say that conservatives are not just interested in a balanced budget. They want a limited government which is, you know, a smaller government, a less expansive government. That’s really a conservative argument here, that too much government undermines the independence and responsibility of citizens. ABERNETHY: The Ryan budget drew sharp criticism from many in the religious communities, among them former congressman and ambassador Tony Hall. 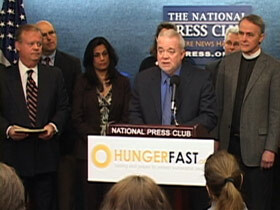 TONY HALL: We need to get our fiscal house in order, but not on the backs of the poor and hungry. They didn’t get us into this current mess, and hurting them is not the way out of it. ABERNETHY: Jim Wallis is the editor of Sojourners magazine. JIM WALLIS: Those of us who are Christians are bound by Jesus’ command to protect the least of these the most, the most, so we ask what would Jesus cut? 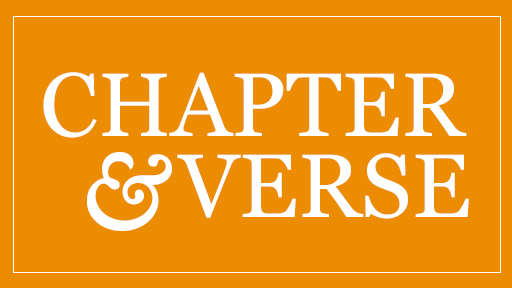 ABERNETHY: The two chairmen of the Catholic bishops committees on domestic and international justice wrote Congress expressing their “serious concern.” So did 75 scholars, most of them at the Catholic University of America. Sister Simone Campbell, executive director of the Catholic social justice lobby Network, says she and others oppose the House budget because it doesn’t seem to reflect Catholic social teaching. 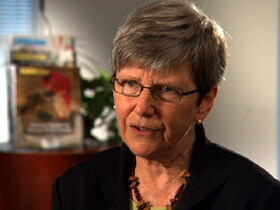 SISTER SIMONE CAMPBELL: The essence of Catholic social teaching is that it is based on the dignity of the human person, that we all hold dignity because we are created by God, that together in society we hold shared responsibility for each other. Government’s role then becomes to ensure that the least are cared for. That’s why it’s so chilling to us to watch what’s going on in Congress about the budget. It’s the very safety net programs that the current budget fight is targeting, and to me this is wrong. It, quite frankly, is immoral. ABERNETHY: Congressman Ryan, too, is Catholic. He agrees that the poor and sick should not be hurt, but he insists the way to avoid that is to keep taxes low so private investors can create new jobs. CAMPBELL: That’s just wrong. The wealthy have recovered to pre-recession levels. Are they investing in jobs? No. ABERNETHY: And what about leaving massive debt to our children? CAMPBELL: I think it’s not a good idea. But there is a simple fix. You can solve this issue in a very simple way. Raise revenue. ABERNETHY: Not something easy to do. As the moral debate sharpened, Ryan wrote a letter to the president of the Catholic Bishops Conference, New York Archbishop Timothy Dolan, insisting that his budget does indeed respect Catholic social teaching. The archbishop replied that he was happy to hear that. In the midst of the arguments, there was a brief diversion over the ideas of Ayn Rand, the late atheist writer and philosopher whose book, The Fountainhead, and a movie based on it, were popular in the 1950s. Rand preached a radical, small government, everyone-for-himself libertarianism which some congressmen, among them Paul Ryan, said they had admired. A liberal blogger tried to discredit them with a film contrasting Rand’s selfish individualism with the teachings of Jesus. In spite of all the claims and charges, many observers do see middle ground. SIMPSON: You can’t tax your way out of this baby, and you can’t cut spending as your way out of this baby. It has to be a blend. ABERNETHY: But all the moral debate has not made compromise easy. GERSON: I think moral motivations in politics are very important. But when you claim that your own views somehow have a divine sanction, you’ve cut off all political argument. This should be an argument about outcomes, what is really best for the justice and decency of a society. I think a limited government is important to that, and I think a government that provides some of the most basic needs for the most vulnerable people in society is important to that as well. That’s where a lot of Americans are. ABERNETHY: Alan Simpson thinks his former colleagues will head off a national crisis and that their constituents will accept the need for sacrifice. SIMPSON: I think there are a lot more heroes in Congress than we recognize. ABERNETHY: Gerson and Rivlin say they, too, are at least somewhat optimistic. GERSON: You are going to have to have Republican and Democratic leaders come together around this. They’re very dug in, but there is no other choice. RIVLIN: There will be a lot of posturing and a lot of difficulty, but we will raise the debt ceiling, and over the next several years we will bring our debt under control. 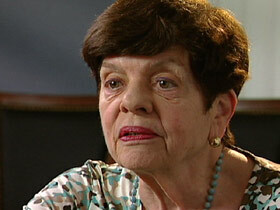 ABERNETHY: Alice Rivlin was the director of the budget offices at both Congress and the White House. She served on two budget commissions. She says last year there were unofficial focus groups in 26 cities that were asked to work on the debt problem. When they heard the facts, Rivlin says, each of them was able to work out a plan. Not all of them came up with the same solution, but no one failed to reach agreement on something. It seems to be quite different for Congress and the White House, raising the question whether the federal government can compromise and act on an issue as difficult as this one, with so much moral passion and partisan ideology. More on this with our managing editor Kim Lawton. Kim? KIM LAWTON: Bob, the religious community continues to be very involved in this debate, bringing some of that moral passion, and they are lobbying on both sides or all sides of this issue. This week we had 24 religious and charitable organizations writing a letter to the Administration and congressional leaders saying in all of your debt ceiling discussions don’t forgot about the poor, the vulnerable, the least of these, what they called them. And on the other side you had religious conservatives lobbying Congress, saying don’t accept any debt ceiling solution that doesn’t include dramatic spending cuts, and they also used moral language, saying it’s wrong to leave debt to our children, using a biblical passage to support that. So, again, energy on all sides on this moral question. ABERNETHY: That’s right, and morally and ideologically it spills over into the whole idea of a smaller government, which of course is what the conservatives want very much. LAWTON: And that’s a big issue on the campaign trail, too, which is really heightening all of the political rhetoric on Capitol Hill out on the campaign trail. So many of the GOP candidates are out there really appealing to the conservative base, talking about these issues. Michele Bachmann, the new GOP candidate, who is an evangelical Christian, very much reaching out to her base saying I’m not going to support, I’m not going to vote for any debt ceiling measure that doesn’t include dramatic spending [cuts]. And of course, you know, religious conservatives are so important for the GOP during this period because about forty percent of Republican primary voters are self-identified evangelicals, so everybody’s sort of reaching out to them, seeing it as a big stepping stone. ABERNETHY: Do they have any favorites so far? LAWTON: They seem to be pretty divided still. Michele Bachmann polled very well in Iowa this week, which surprised a lot of people. She’s very popular among those very conservative religious groups. But there are disagreements among evangelicals. Some take a more moderate point of view. Evangelical leaders in a recent poll liked Tim Pawlenty, Minnesota governor, but he’s not as well known nationally, so there still seems to be a lot of room for jockeying among evangelicals. ABERNETHY: Meanwhile, there’s the whole issue of fourteen million people who can’t find jobs. LAWTON: And that’s the big issue that’s really dominating everything, and people are jockeying for a solution, and no one seems to have a good solution. So, indeed, that’s really been overshadowing so many of the other issues that you often hear about early in a campaign, and that’s what you see the candidates talking about, and obviously that’s what you see members of Congress wrestling over with the Administration as well.